The other morning my car wouldn’t start, so I had to take my husband’s to work. He winced when he offered me the car. I didn’t have time to worry about that, so I climbed into the front seat, shoved a board out of the way and hooked the handle of my coffee mug onto the butterfly net riding shotgun with me. I clicked on NPR and ignored the empty Powerade bottles and gym shorts with the tags still on them next to me. Before I exited the car and headed into school, I glanced into the back seat to find a halogen light, rubbermaid containers filled with rolled up strips of cardboard, a beekeeper’s veil, and a 4 x 250 ft roll of laminating plastic. 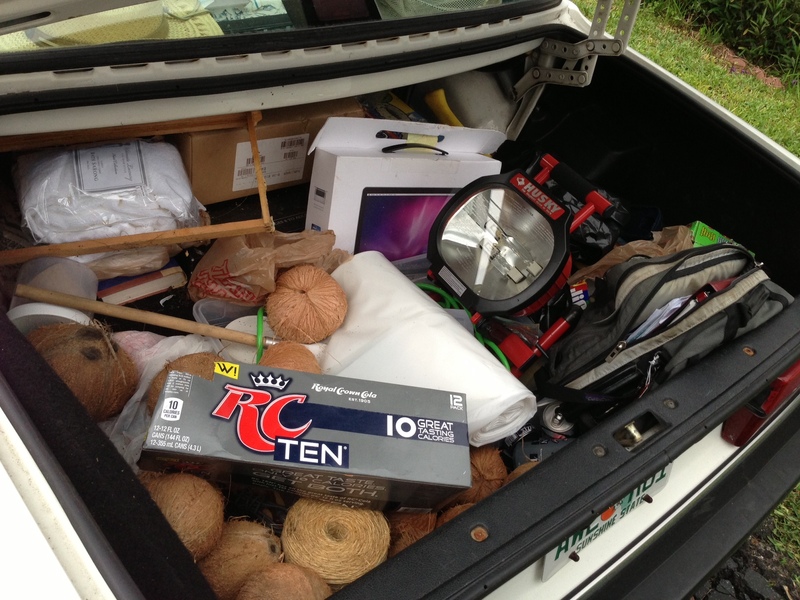 I didn’t even open the trunk, but it was filled with at least two dozen coconuts. My husband was horrified that I’d seen his shame. It’s the same reason he gets uncomfortable if I walk on his side of the bed because it means I might trip on clothes, comic books, empty boxes, a suitcase, or general trash. The only difference between his shame and mine is that I keep mine off the floor. I prefer to put it in a closet or on top of a dresser. This whole anecdote got me thinking. Everyone needs a corner of shame. No matter how much we gloss up the outside to look organized and healthy, our humanness dictates that we allow ourselves a place for disgrace. A place we pray no one will accidentally discover. Because if we know they’re coming, we’re going to clean it up first. What we present to the outside world is often not our complete truth. But we write it as if it were. The internet is full of “how to live your best life!” advice and tutorials. The mecca of these places is Pinterest. If you’re not DIY-ing your sugar-free life of quinoa recipes while doing squats on your Chevron-print rug, you’re not really living. How to organize your jewelry with wine corks. I am not against any of these things separately, but when presented all together as prescriptions for living “happier and healthier,” I carve out a space to eat Cheez-its and watch Oprah in protest. Pinterest has upped stress in the lives of many, but I still find it useful for ideas I turn into reality, especially recipes and home improvement inspiration. The key is to focus on the things you want in your life, not the things other people want. This is difficult because people present these options as all-or-nothing propositions. You’re either eating clean or eating dirty. Fit or lazy. Crafty and DIY or unskilled and materialistic. Organic parents or mainstream parents. They forget it’s possible to be both at different times. I think it’s because we try to convince ourselves by convincing others. In my quest for the best workout routine, I’ve found the path of least resistance has been the easiest to maintain. The go hard-or-go-home approach is only sustainable for so long. For periods of time in my life, I’ve exercised and lifted weights obsessively; I’ve become a regular runner; I’ve taken three exercise classes in one day. I could not be stopped. Until I stopped completely. Which happened every time. Now I’m at a period in my life where I feel like I’m doing the least amount of regular exercise, but I’ve been able to maintain the same weight the best this way. I take a weight and cardio class at least once a week, I started doing push-ups every day, and I cook healthy meals. I walk/bike/run to supplement but it’s in moderate amounts. We use our rare night of eating out to indulge in more high-calorie foods, and we eat dessert more than I ever have in my life. Small amounts at a time, but more frequently. My next feat is to work this kind of manageable routine into my job and my writing life. While I understand the need to present our best selves publicly, I respect people more who aren’t afraid to show their corner of shame. Or they’re terrified but go through with it in order to better themselves. I am working to develop this type of openness as I’m less and less interested in looking good and more interested in feeling good and actually being good at something. When I moved out of my house in Richmond, I was horrified for people to see my “room of shame” upstairs. After two friends helped me start to clear it out, I felt more motivated to cipher through the rest of the house. By showing them my shame, it removed the stigma and I was able to move forward. Me seeing my husband’s car motivated him to clean it out and get the air-conditioning fixed just a week later. I’ve been mulling over this post for the past couple of weeks (and not writing it), then today I watched a Creative Mornings talk author Austin Kleon gave in Austin, Texas. His talk is about showing your work online instead of waiting until the perfect finished product is unveiled. His talk is about honesty in the creative process. His talk is very similar to what I wanted to write this post about. He has an insanely bigger internet audience than I do, but I like to think my emphasis on shame over work makes this unique? For the past few weeks, I’ve been interviewing people about their transitions in life, and by slowly understanding how people overcome obstacles, be they self-inflicted or outwardly-inflicted, I’m getting a deeper understanding of how to actually cut away what you don’t want in your life. I believe you have to cut away to create. You can’t create anything while hiding in your corner of shame.